Google today announced new integration between Gmail and Google+ that sees your social connections show up in auto-complete when you’re composing an email. Google says the feature is rolling out “over the next couple of days” to everyone that uses Gmail and Google+. The good news is that your email address isn’t visible to a Google+ connection unless you send a reply. The reverse is also true: his or her email address isn’t visible to you unless he or she replies to your email. 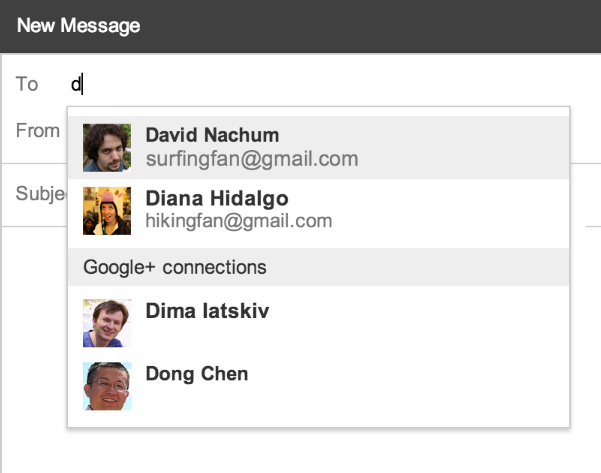 Last but not least, emailing Google+ connections also relies on Gmail’s new inbox categories: if someone in your circles emails you, the email will appear in the Primary category, otherwise it will be filtered into the Social category (if enabled). Google says that the latter emails will only be sent once: the person can’t email you again until you respond or add them to your circles. These are potentially useful additions for Gmail users who actually use Google+, although there is clearly room for annoying emails. We would recommend adjusting the “Email via Google+” setting in Gmail once it’s available to avoid receiving message from people you really don’t want to spam your inbox.